Nine new public charging stations for electric vehicles have opened in London this week. For EV drivers its good news, with unlimited use of the charging stations once they pay the £100 yearly fee. 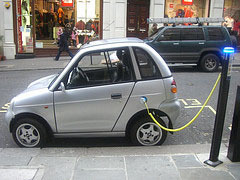 EVs like the Reva G-Wiz are gaining in popularity in the UK because they are exempt from the congestion charge that drivers have to now pay to drive into central London. The new charging stations, also known as Elektrobays or Juice Points, are in the western and southern parts of the city. For exact locations check the website. Existing stations already set up around Westminster have already attracted over 80 people to sign up. Drivers can charge their EV's for up to four hours, but most have been using only two hours or less. The next job on the agenda is to get Juice Points set up into the 48 parking garages in the city and at a total of 250 charging stations, 200 around London, and 50 in regional centres.